Audio Assault RM-2 Console Emulation Plugin. Featuring a 3 band smooth and gentle console style EQ section and saturation modelling I find RM-2 to be a great insert on buses for tone shaping. Throw it on a guitar bus to tame some mid’s or highs or push the drive for more grit and boost the highs on the drum bus to really get your drums going. Loosely based of the Panasonic Ramsa WR-S4424 console from the 80’s this thing has some vibe to it. The saturation algorithm is pretty good. From very clean to extreme there’s a lot of use to be had in this one control alone. The high band (centered around 12.5Khz) provides smooth high end that get’s airy and bright but never harsh. Even with this control at 100% it still doesn’t get too much. The mid band (centered around 2Khz) is a frequency range that the human ear is very sensitive to. Great for when you have a bit too much in say guitars. Roll this control back to smooth them out. This control work much more extremely, you can scoop and excessive amount of mid’s out if you dial it back too far. The Low band (centered around 70Hz) is great on bass guitar, kick drums and synths. A good range of control here and very usable. Input and output controls can be linked for perfect gain compensation or left unlinked (default state). A handy feature to have. It’s worth taking a look at this plugin to capture a little bit of that console sound without the added noise floor of the actual hardware. Currently still on sale at a ridiculous price of $5 (normal price $34.99) and a demo available to download I think this plugin is worthy of at least a test drive if you’re looking for this type of emulation. 10/10 to Audio Assault from me a great little plugin. 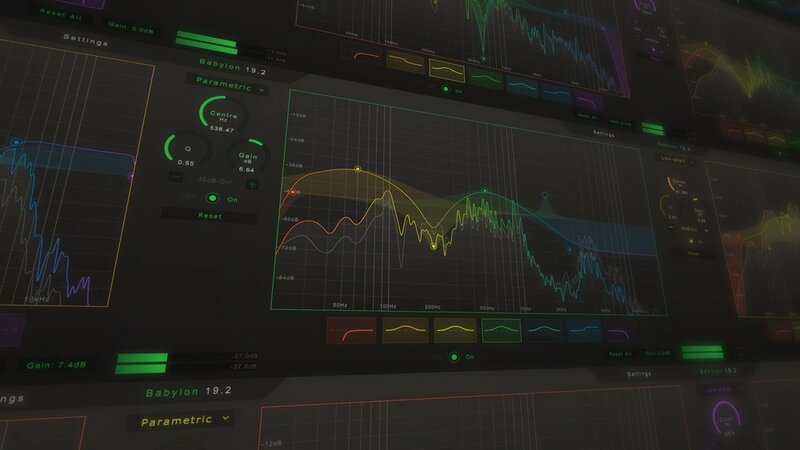 Great EQ plugin on sale right now! I came across a great EQ plugin called Babylon EQ by Gramotech that I thought I’d share. It’s a multi band EQ with a slick looking user interface and easy to read spectrum analyser. Babylon is a comprehensive multi-band EQ featuring eight fully automatable filter types, a high-resolution spectrum analyser, the ability to combine any of the eight filter types across the seven filter bands, and stunning visuals. Each of the seven built-in filters can use any of the eight filter types giving a huge amount of customisation for you to achieve your perfect sound. Low-passAttenuates frequencies above the cutoff frequency. This is perfect for isolating higher-frequencies in your sound, such as cymbals in a drum track. High-passAttenuates frequencies below the cutoff frequency. This is great for removing high-end noise from a track. Band-passAttenuates frequencies outside the band. Perfect for creating a lo-fi sound be cutting extreme highs and lows. Band-stopAttenuates frequencies within the band. Useful for removing resonating frequencies. Low-shelfAmplifies frequencies below the corner frequency. Perfect for evenly boosting or reducing low frequencies. High-shelfAmplifies frequencies above the corner frequency. Great for boosting or reducing high frequencies like cymbals. ParametricAmplifies frequencies around the centre frequency with reduced amplification further from the centre. Most flexible filter type - great for boosting or cutting select frequencies. All-passAllows all frequencies pass unaltered but inverses the phase of frequencies about the cutoff frequency. An experimental filter type - great for producing phasing effects (or removing unwanted phasing), lo-fi reverb effects, or many other applications. The colourful spectrum analyser gives you the perfect visual representation of your frequency domain and with the option to choose the block size and ramp you can adjust the analyser to your exact needs. The input signal is shown in the background of the spectrum in grey to show the exact effect of your chosen filter settings. Use the control points on the spectrum analyser to quickly and easily adjust the parameters of each filter. As always I focus on offering affordable mastering services. Get an album of up to 15 tracks mastered for only £199. Possibly the most affordable professional mastering offer out there? Book now via our website, limited time only! Professional quality mastering at affordable prices from Steve at mix2master.co.uk. Yes my mixing and mastering experience for the low price of £60 is still available. From 1st of March prices will be changing. Book your project in before then to secure my super competitive price. Thank you to everyone for a great start to the year I've enjoyed each and every project I've been involved in! Affordable mixing and mastering experience. So why use a mixing engineer? Do you need a mixing engineer? Hornet plugins, affordable audio plugins walkthrough. Tagged: sknote disto review, sknote disto plugin, sknote disto distressor, sknote disto emulation, distressor plugin, distressor plugin emulation, distressor plugin?